George Frideric Handel (born February 23, 1685, Halle, Brandenburg (Germany) – died April 14, 1759, London, England), German-English composer, who is recognized as one of the greatest composers of the late Baroque age, and, during his lifetime, perhaps the most internationally famous of all musicians. He is noted particularly for his operas, oratorios, and instrumental compositions. 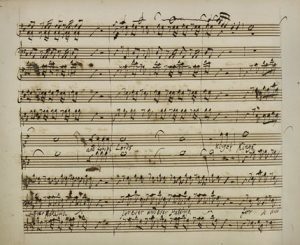 Handel wrote the most famous of all oratorios, Messiah (which has become an object of reverence in many Christian, especially Protestant communities), and is also known for such occasional pieces as Water Music and Music for the Royal Fireworks. George Frideric Handel was born to George and Dorothea Handel in Halle, Germany. His father was a barber-surgeon and his mother was a daughter of the pastor. Perhaps through her the future composer inherited his religious nature. From an early age, Handel longed to study music, but his father objected, doubting that music would be a realistic source of income. In spite of his father’s strenuous opposition, he secretly taught himself to play the harpsichord. Handel’s mother was supportive, and she encouraged him to develop his musical talent. With her cooperation, Handel took to practicing on the sly. (The story of him secretly practicing the clavichord in the attic in the small hours of the night has been neither substantiated nor disproved.) To study music Handel had to overcome his father’s objections, and at the same time follow his father’s insistence that he study law. When Handel was still a young boy, he had the opportunity to play the organ for the Duke’s court in Saxe-Weissenfels. He showed a marked gift for music and became a pupil of the composer and organist Friedrich Wilhelm Zachow. Under Zachow’s tutelage, Handel learnt the principles of keyboard performance and mastered composing for the organ, the oboe and the violin, and by 1695 Handel was composing for these and other instruments. From 1696 until 1701 Handel composed many works. Unfortunately, the church cantatas and all but a few pieces of chamber music that he composed at the time have disappeared. In 1702 he enrolled as a law student at the University of Halle. Not surprisingly, he did not remain enrolled for long. His passion for music would not be suppressed. At the age of seventeen, Handel accepted a position as organist at the former Dom in Halle. Although his first job was as church organist, Handel’s musical tendencies lay elsewhere. Contact with German composer Georg Philipp Telemann, and a meeting shortly afterward with the composer Agostino Steffani, spurred Handel’s operatic ambitions. In 1703 he went to Hamburg – the operatic centre of Germany – where he became a violinist in the Goose Market Opera orchestra. He also took over some of the duties of harpsichordist. His friendship with composer-singer Johann Mattheson, subsequently his biographer, was begun here. Handel remained in Hamburg from 1703 to 1706. During this time, he supplemented his income by teaching private music lessons in his free time, passing on what he had learned from Zachow. Friedrich Wilhelm Zachow (November 14, 1663 – August 7, 1712), a German musician and composer of vocal and keyboard music, is renowned as Georg Frideric Handel’s master. Handel began to compose operas, in 1705 Handel brought out two operas, Almira (his first opera was successfully produced at Hamburg) and Nero. After composing several more popular operas, in 1706 Handel went to Italy, visiting Florence, Venice, Rome, and Naples and stayed there up to 1710. In Italy Handel met many of the greatest Italian musicians of the day, including Arcangelo Corelli and Alessandro Scarlatti and his son Domenico. 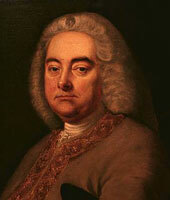 Handel’s years in Italy were very important in the formation of his musical style. 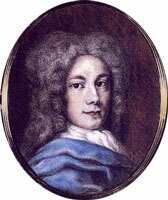 While in there, he managed to write many Italian compositions included two operas, two oratorios La Risurrezione and Il Trionfo del Tempo e del Disinganno , the serenata Aci, Galatea e Polifemo (1708), some Latin (Catholic) church music, and more than 100 secular cantatas with keyboard or instrumental accompaniment. In Florence he brought out his first Italian opera, Rodrigo (1707), and in Venice Agrippina (1709) enjoyed a sensational success at its premiere and spread his fame throughout Italy. The opera triumphantly crowned his Italian composing career. He also became famous as an organist and harpsichordist. Handel returned to Germany at the age of twenty-five to become music director at the electoral court of Hanover, but his years in Italy helped lay the foundations of his style. In 1710, Handel was appointed Kapellmeister to the Elector of Hanover, the future George I of England. Later that year Handel visited England and composed Rinaldo, the first Italian opera specially written for the London stage. The opera was premiered in 1711 and greeted so enthusiastically that Handel sensed the possibility of continuing popularity and prosperity in England. Rinaldo was Handel’s breakthrough. His most critically acclaimed work up to that date, it gained him the widespread recognition that he would maintain throughout the rest of his musical career. Handel’s course was set for the rest of his life. In the autumn of 1712, he was again granted permission to go to London. During the 1710s he settled in Britain, as London became Handel’s permanent home, he proceeded to compose a large amount of music for harpsichord, chamber ensembles, and orchestra, as well as various works for royal occasions. Handel’s first important settings of English words were a Te Deum and Jubilate to celebrate the Treaty of Utrecht and an Ode for Queen Anne’s Birthday (1713). Queen Anne awarded him an annual salary of two hundred pounds. Recognized by prominent members of both the English aristocracy and the intelligentsia, Handel was in no hurry to return to Hanover. Soon he had no need to do so, for on the death of Queen Anne in 1714, the elector George Louis became King George I of England. From 1712 to 1717, the composer worked mostly for the opera house in the Haymarket. When this closed, he was employed for two years by the Duke of Chandos, at Cannons in Middlesex, where he composed the 11 Chandos Anthems and the stage masques Acis and Galatea (1718) and his first English oratorio Esther (1720). 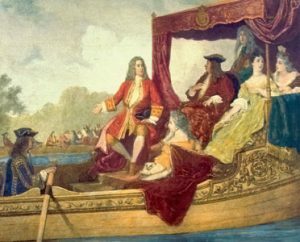 In the summer of 1717, Handel premiered one of his greatest works, Water Music, in a concert on the River Thames. The concert was performed by 50 musicians playing from a barge positioned closely to the royal barge from which the King listened. It was said that King George I enjoyed it so much that he requested the musicians to play the suite three times during the trip. In 1719 Handel became an unofficial music director of the newly-founded Royal Academy of Music, a company organised to establish Italian opera on the London stage; Handel composed some of his best operas, including Radamisto (1720), Ottone (1723), Giulio Cesare (1724), Tamerlano (1724), Rodelinda (1725) and Admeto (1727). In 1727 he became a naturalized British citizen, and that year he provided four anthems for the coronation of George II. The popular success of Gay’s The Beggar’s Opera in 1728 proved that the English public was growing tired of Italian opera, and the Academy began to have financial difficulties. Between 1729 and 1733, Handel wrote six operas – among them the superb Orlando (1733) which he ran at the Haymarket Theatre with the impresario Johann Jakob Heidegger. 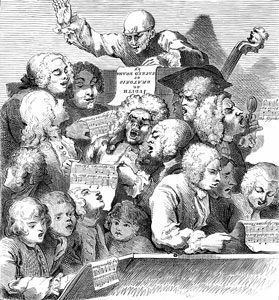 The revivals in 1732 of Handel’s masques Acis and Galatea and Haman and Mordecai (renamed Esther) led to the establishment of the English oratorio – a large musical composition for solo voices, chorus, and orchestra, without acting or scenery, and usually dramatizing a story from the Bible in English-language lyrics. Handel first capitalized on this genre in 1733 with Deborah and Athalia. In the early summer of 1733 a quarrel led to the secession of most of Handel’s Italian singers from his London company and the foundation of a rival establishment, the Opera of the Nobility. Two companies competed for four years, until both were bankrupt. In 1734 Handel found another theatre and started his company at Covent Garden Theatre. There a ballet troupe inspired him to compose such operas as Ariodante and Alcina (both 1735). The best of his later operas were the frankly comic Serse (1738) and the subtly satirical Deidamia (1741). In both he abandoned his weightier style for the melodious idiom newly popular in Italy. Neither was very successful at the time, but Serse eventually became a favourite in modern theatres. His major success of the period was the setting of Dryden’s ode Alexander’s Feast (1736). In April 1737, Handel suffered a stroke that paralyzed his right arm. His fans worried that he would never compose again. But after only six weeks of recuperation in Aix-la-Chapelle (Aachen), Germany, Handel was fully recovered. He went back to London and not only returned to composing, but made a comeback at playing the organ as well. Following a cure he wrote such masterpieces as the Funeral Anthem for Queen Caroline (1737); the oratorio Saul (1739); Israel in Egypt (1739), an oratorio with Biblical text; the 12 concerti grossi (Opus 6; 1739); and the ode L’Allegro, il Penseroso ed il Moderato (1740), based on Milton. Back in London his life fell into a regular pattern. In the summer he composed; in the late winter and spring, generally during Lent, he conducted London seasons of oratorio. These were all at Covent Garden, except that of 1744-1745 at the Haymarket, which was a financial failure and led to another breakdown in his health. However, he stunned audiences once again with a speedy recovery, followed by a prolific stream of ambitious oratorios. Handel’s three-act oratorio Samson (based on Milton’s Samson Agonistes), which premiered in London in 1743, reflected how Handel related to the character’s blindness through his own firsthand experience with the progressive degeneration of his sight. 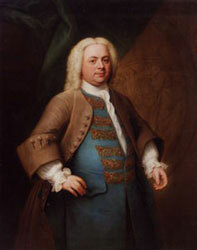 Handel continued to live a dramatic and productive life during the 1740s, writing diverse works such as Biblical dramatic oratorios Belshazzar (1745) and Solomon (1749), secular music dramas based on Greek classical tragedies Semele (1744; based on mythological text by William Congreve) and Hercules (1745) and patriotic concert works. The most successful of the series was Judas Maccbaeus composed in 1746 in tribute to the Duke of Cumberland’s victory over the Jacobite at Culloden. With Judas Maccbaeus, Handel’s oratorios began to enjoy real success, though nothing like what the operas in their heyday had. Handel also continued to compose instrumental music and occasional works for church and state. These included Dettingen Te Deum, hastily composed to celebrate George II’s victory against the French in 1743, Music for the Royal Fireworks (1749), celebrating the peace of the Treaty of Aix-la-Chapelle and the Foundling Hospital Anthem (1749). Early in 1751, Handel started Jephtha, his last oratorio, he began to experience trouble with his sight. An operation was unsuccessful, and he soon became blind. He managed with great difficulty to finish Jephtha, which was performed at Covent Garden Theatre, London, in 1752. Though being completely blind Handel kept his interest in musical activities. As always before, Handel’s passionate pursuit of music propelled him forward. He kept on performing and composing, relying on his sharp memory to compensate when necessary, and remained actively involved in productions of his work until the end. 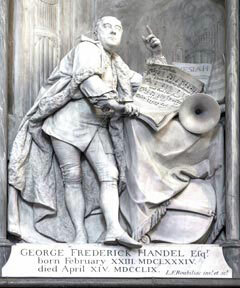 Handel died in London on April 14, 1759. Three days before his death Handel signed a codicil to his will saying he hoped he might be buried in the Abbey and desired that his executor erect a monument for him. A week after his death he was buried with public honours in Poets’ Corner in Westminster Abbey. George Frideric Handel was the most imposing figure in English music during his lifetime, and it was the English public that nourished his genius and remained loyal to his memory.